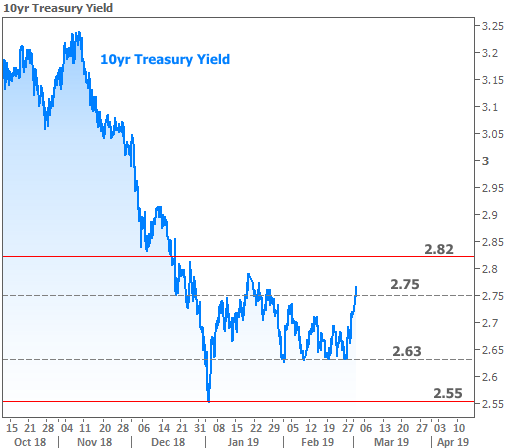 The year began with a sharp move lower in rates–sharp enough that it wasn’t sustainable. 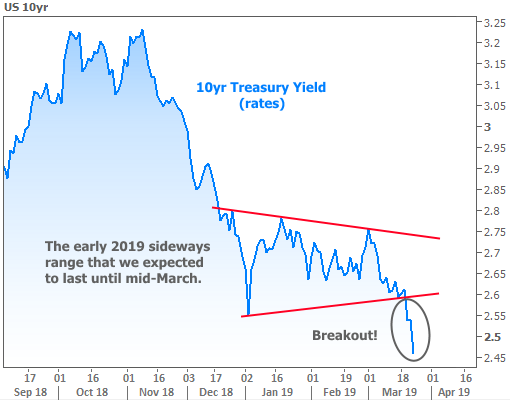 Rates rushed to long-term lows on January 3rd and then bounced higher. Fortunately, they found a ceiling shortly thereafter. That ceiling ended up being the top of the sideways range we’ve been following ever since. 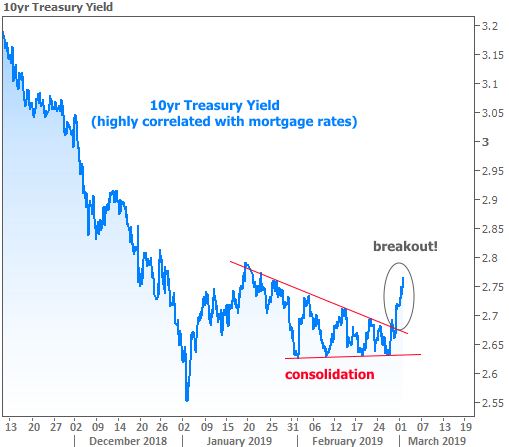 Fast forward to this week and it was indeed the Fed Announcement that served as the catalyst for an actual breakout. This time around, it’s going in our favor. If you see the little hitch in the blue line in the “breakout” section above, that’s as far as the Fed news was able to get us on Wednesday. The rest of the move happened Friday on a combination of weak European manufacturing data followed by similarly weak US data. The answer is “yes.” The Fed sets policies based on its interpretation of economic data and risks to financial stability. Those policies can have massive impacts on markets, but they’re ultimately beholden to the underlying economic realities. When the economy is perceived to be at more risk, the Fed is more likely to enact policies that are friendly for rates. 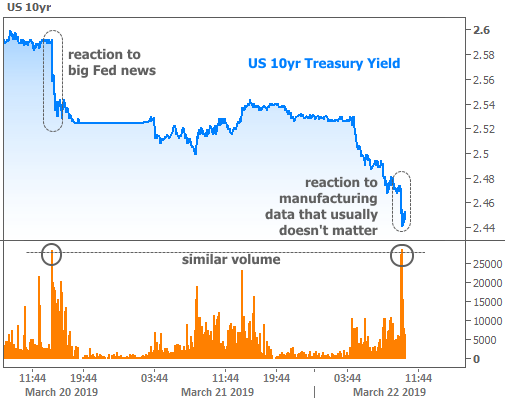 The mere expectation of such a Fed shift was behind last week’s drop in rates, but the actual policy change was even more aggressive than markets expected. It was so aggressive that one may wonder just what sorts of red flags the Fed is seeing. Sure, they’ve SAID they’re concerned about a potential downturn in Europe with global consequences, but where’s the proof?! Then a day a half later, the Eurozone manufacturing data comes out at the lowest levels in years, and European bond yields fall into negative territory. Score one for Fed apprehension. 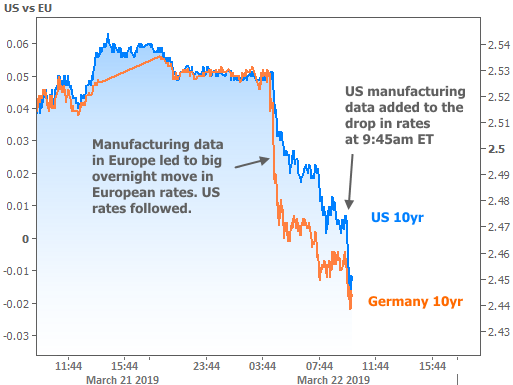 Then the US manufacturing data (highlighted in the chart above) spoke to the “global consequences” just a few hours later. 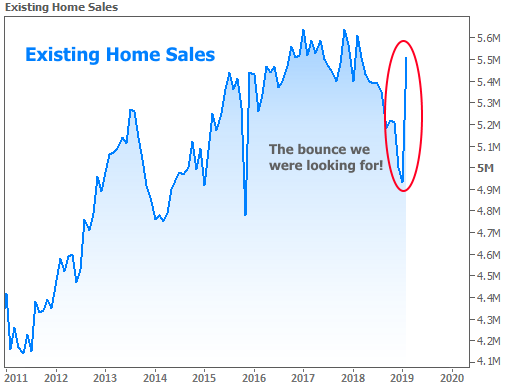 Long story short, all the potential positive cues that looked like they should play out for home sales ended up having the expected impact. 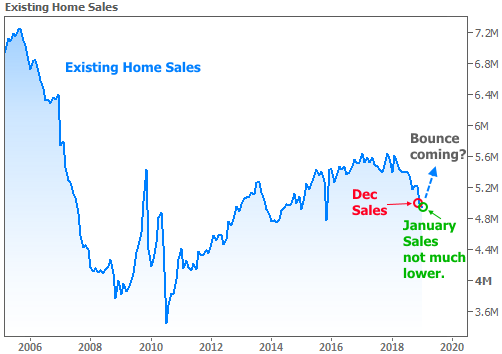 The fact that this week’s data arrives when mortgage rates are hitting new long-term lows is just icing on the cake.